This is my own design called Holiday Ornaments and measures 10 1/2 x 18 1/2. It is wool using both #8 and #8.5 strips with the tops of the holiday balls hooked in a silver metallic yarn. The background is a cream tan and blue textured wool and the ornaments have both as is and over dyed wool. This Dapper Snowman is 22" tall from top hat to bottom of shoes. His body is cloth and his head clay covered Styrofoam which has been painted then glitter sprinkled over the head and hands. He can either sit or hang. He holds rusty snowflakes. $50 plus shipping. Snowflake is all decked out in her holiday finery and ready to celebrate. She is made out of linen spun cotton, coated with an artists medium and painted using acrylics. Her head is segmented, stitched and stuffed. Her bloomers have a red rick rack trim at the bottom. She measures 26" from top of hat to bottom of toes. Snowflake can hang on the door or wall or sit. Yours for $50 plus shipping. 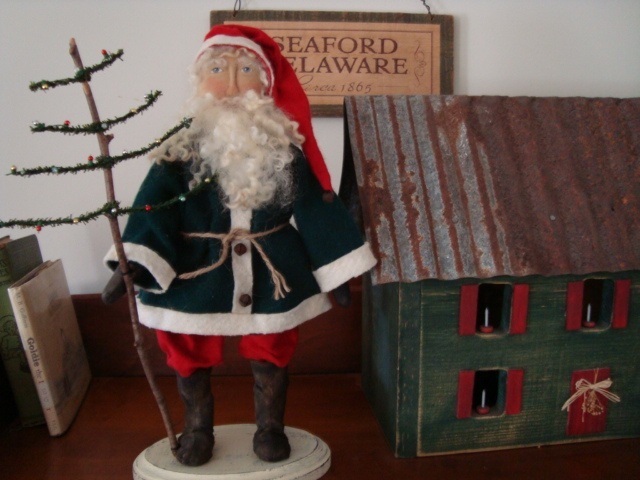 This Santa is standing on a wooden base and measures 16" from bottom of base to top of cap. His boots are osnaburg which has been painted and antiqued, the pants and stocking cap are red flannel and the coat is green wool. There are rusty bells to embellish the front of the coat and tip of cap. Santa's nose is needle sculpted and facial features painted with acrylics. His beard and hair is wool fleece. He is holding a primitive 'Charlie Brown' type tree which has tiny lights attached to it. Yours for $65 plus shipping. Freezin' Frannie is 18 1/2" tall from the top of her dark green wool stocking cap to her feet. Her cap has a bell sewn to the tip. She is made of cotton which has been painted and sprayed with a light coat of glitter on her face, hands and feet. Her cotton dress has been hand painted with acrylics and ironed for color fastness. Santa in a vintage quilt measures 28 1/2" tall from his cap to his shoes. His nose is needle sculpted and facial features painted with acrylics. As stated, his coat is vintage quilt which has been trimmed with the original cotton batting and rusty bells down the front. His pants are black flannel, boots have been painted on. Santa's gloves are green wool as is his scarf. His beard and hair is sheep's wool. Yours for $75 plus shipping. Santa and Deer rug is an adaptation of an antique rug and hooked using #8 and #8.5 wool strips on Dorr natural primitive linen foundation. 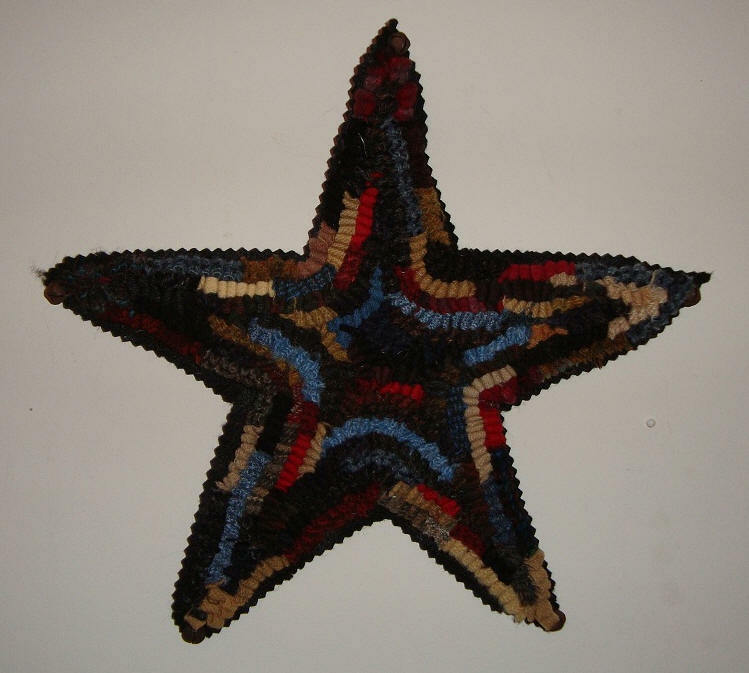 The rug measures 23" x 25" and is bound using 3" wide sturdy cotton binding. There is a lable on the back indicating I hooked it and the year. Feel free to ask for photos of the back. St. Nick measures 23" from hood tip to toe, has a ribbon to hang with or he can sit. Nose is needle sculpted, face, mittens and boots are painted with acrylics. He wears a wool coat and homespun pants. Beard and hair is wool roving. $45 plus shipping. Santa with Candy Cane measures 16" from the top of his hood to bottom of feet. There is a small gold bell adorning his hood which is the same vintage wool stripe blanket that has been used in his Santa Pants. 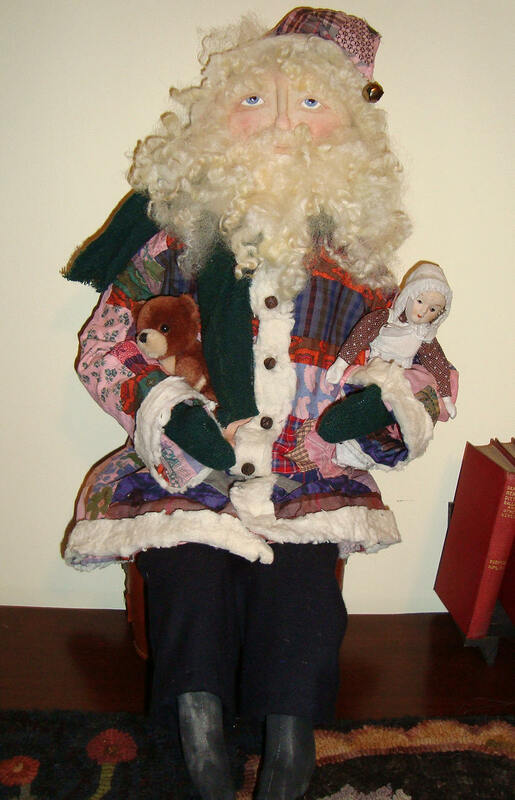 There are white pearl beads as buttons on the vintage wool blanket Santa suit. Santa may hang with ribbon or sit. Yours for $40 plus shipping. 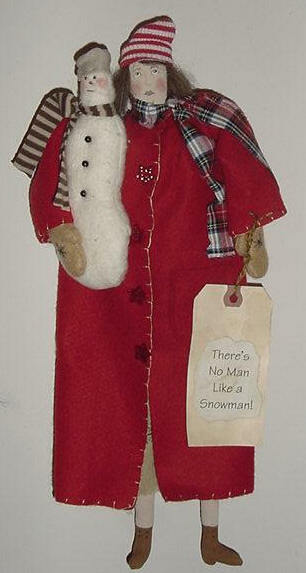 There's No Man like a Snowman, according to this warmly dressed gal. She measures 16 1/2" tall from top of stocking cap to shoes. The coat is felt and the snowman made of warm n natural. Because of the angel of the photo, you cannot see that all the red star buttons have little gold shiny dots on them. $45 plus shipping. These have sold but look for more soon. This hand hooked star measures 11" across from point to point. It is hooked using wool strips and is backed with a piece of felt which has been trimmed with pinking shears. There is a hanger attached to the back for hanging but could also adorn a tabletop or chest. Rusty bells are attached to each of the points. The stockings measure approx. 17 1/2" long and 6 1/2" across. They are made of 100% wool and while hard to see, the white snow cuff has some sparkle and the words "snow" is stitched on with embroidery floss. Yours for $18 each and may be purchased separately. Shipping would be extra. The Winter Woolen Stockings are stuffed with excelsior, purchased greenery, vanilla sticks, vintage garland and antique dollie. 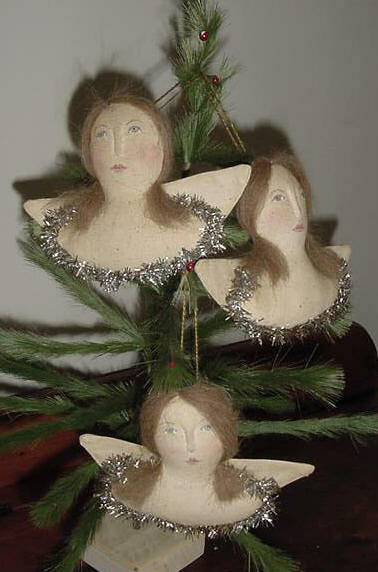 The Angel Ornaments could be hung on a tree, embellish a gift wrapped package and make it extra special, could also be a door knob decoration. And frankly, it doesn't really need to be used only during the holiday. It could be a little 'thank you' gift to someone who had been an angel to you. They measure approximately 5 1/2" from top of head to garland trim and 7" wing span. The nose is needlesculped, facial features done with both pigma pen and watercolor pencils. The hair is wool roving. Holiday Hannah is a snow lady and suitable to display all winter. 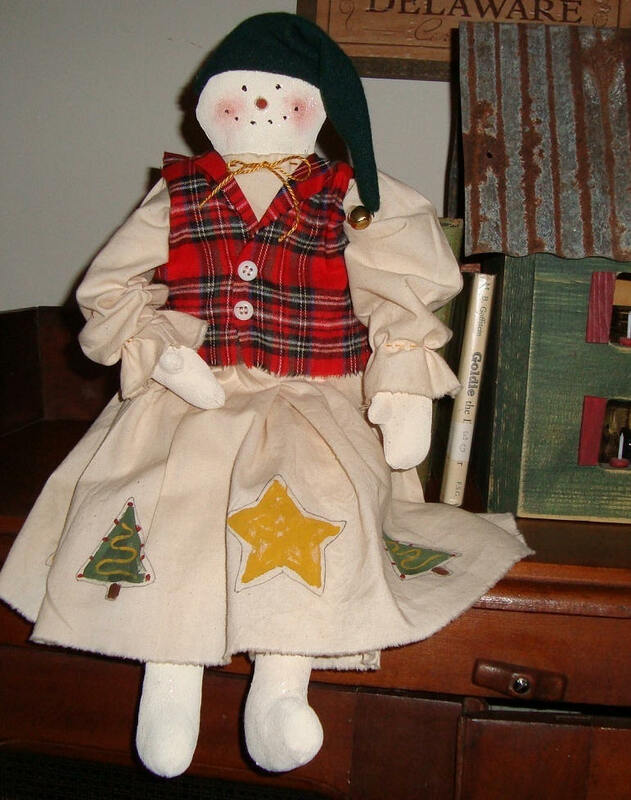 Hannah is 31 1/2" tall, has button eyes, stitched nose, embroidered lips and her sinew hat has a plaid flannel band, purchased greenery and sprinkled with a little glitter. 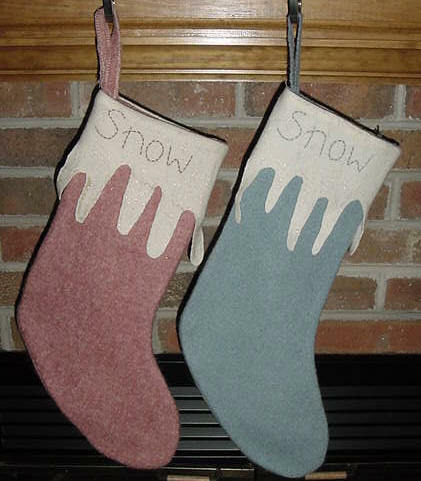 The under dress is embellished with drawings of snowmen, garland, wording and "Love Snow" is colored in light green and sprinkled with a little glitter. The patchwork jumper is made of strips of flannel in coordinating colors with buttons at the straps in front. A Kindred Spirits design, Hannah is holding a snowman made of warm & natural. She is $55 plus shipping. We all usually have generic gifts at Christmas for the unexpected guest who drops by to give us one. I usually have a nice bottle of wine handy and it is nicely wrapped as if waiting just for them. These fabric wine bottle gift wraps are perfect as it gives the recipient two gifts in one. They can have their wine and drink it but also have a decorative fabric cover when they give a Christmas gift of wine. I have a variety of fabric designs and each fabric design comes with it's own fancy ribbon. Ribbon color may vary depending on design of fabric. 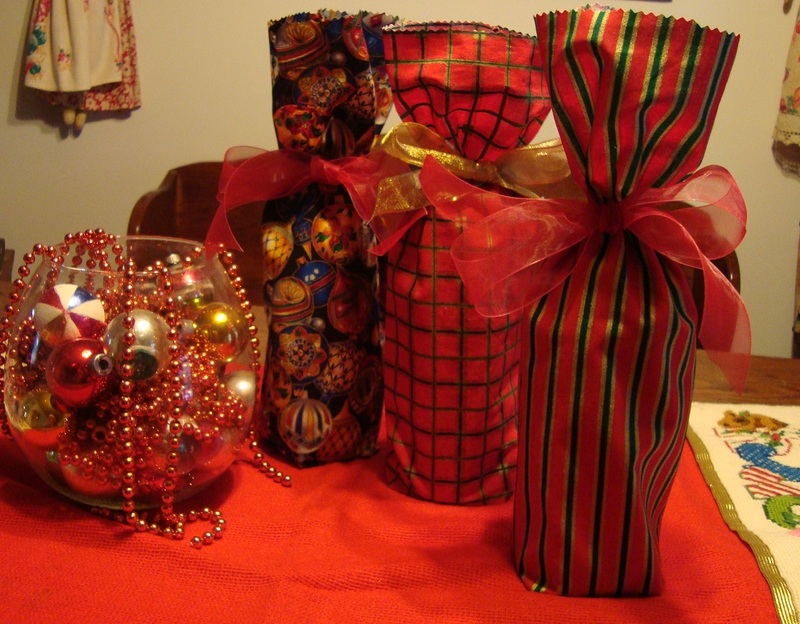 Wine bottle gift-wrap and ribbon is $10 each plus shipping. 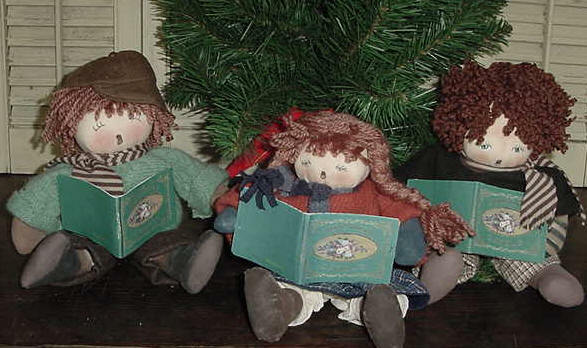 These cute Carolers are named Timmy, Lily and Billie. In this seated position they sit approx. 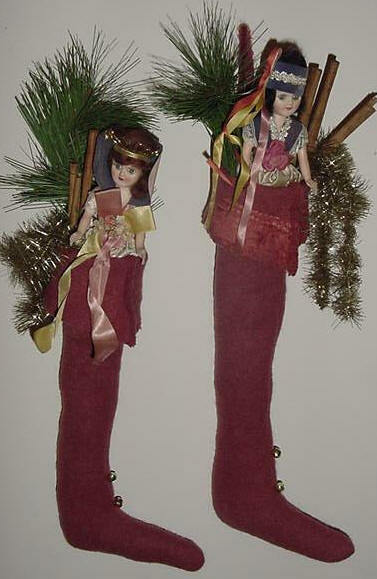 8" tall, are made of cloth and stuffed with fiberfill. Their shoes and mittens are painted with acrylics and the facial features are drawn with a combination of Pigma pen and acrylic paints. Their hair is made with yarn. These cute little kids can be yours for $40 each plus shipping. BILLIE has been sold. These Folk Art Santa's are 12" tall, made of canvas, stuffed with fiberfill, coated with a gesso solution, painted with acrylics and an antiquing medium applied on top of that. This item has sold. Check back for other items. 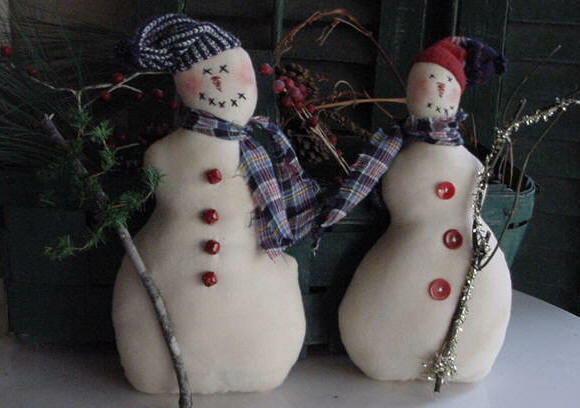 Folk art Snowmen made of quality cotton, homespun scarves and knit caps. Facial features are embroidered. Sold individually. The Christmas Stone Angel would make a wonderful centerpiece during holidays. I show her here with red bead garland and halo. However, you could drape other decorations for Easter, Halloween, etc. Her head is sculpted clay with a body, wings and clothing made of quality woven cotton, with lace at the neckline. The clothing is stiffened with an acrylic paint mixture to resemble a Stone Angel Statue. She stands 25 1/2" tall, has well formed fingers and toes. Stone Angel is meant to be an inside work of art that would look lovely in a garden bath area, a sunroom with plants, and a center piece for holidays. Easter you could put vintage post cards between her thumbs and fingers. This is a technique taught me by the talented Cat Mahone. Stone Angel may be yours for $65 plus shipping.